In just a few days, I'll be doing a giveaway in cooperation with Cooking Planit, an app and website that is like a virtual cooking assistant. It helps you coordinate full meals, prepare shopping lists and takes you step by step through the recipes, which I love. I can set up my iPad in the kitchen and it will show me (and talk me) through the steps, allowing me to pause if I need to. Click here to read about the Honey Mustard Glazed Salmon I made recently using Cooking Planit. It could not have been easier and turned out so good. Now Cooking Planit has supplied me with a T-fal 12-piece set that includes a Covered Dutch oven, sauce pans, sauté pans and stainless tools. 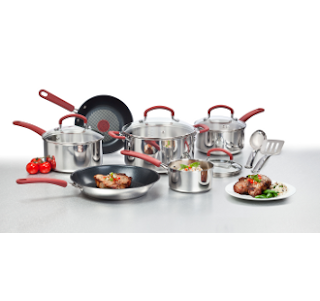 It's a stainless steel and non-stick premium set that I'm excited to try out and you'll have a chance to win the same set, too. My giveaway will start on September 6, so be sure to come back and enter. However, you don't have to wait that long for a chance to win and to read about what some other bloggers have cooked up using Cooking Planit. There are a total of 50 bloggers taking part in this project, so there are other contests already in the works. Here's a list with links to those sites.